Can anyone fill in the people on this photo? My mum is Kathleen June Bramford (3rd from left on the front row) who used to live at Staunton Grange. Enquiries by Sue Dunsmore have allowed most of the children to be identified, thanks to the assistance and memories of Jenifer Norris and her family, and also to Colin Clayton and Melvin Bradbury. Cecil Patchett, my mum thinks this is Edward Booth? Rayson, think it could be George Fletcher? Six of the children remain to be identified. 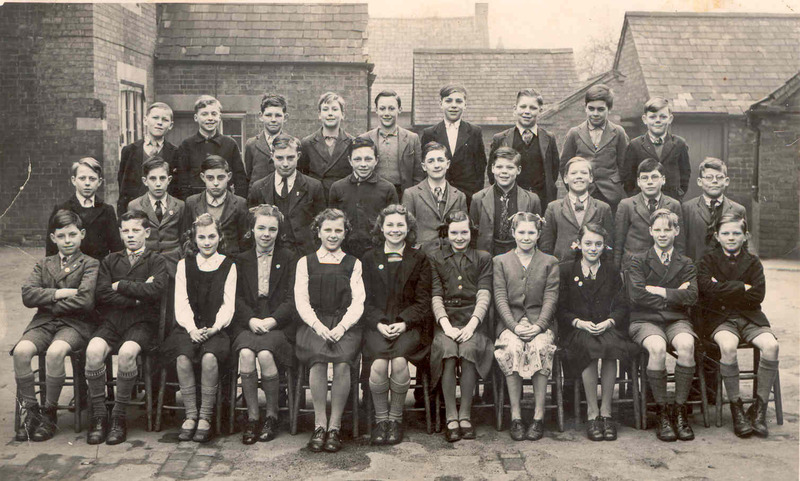 Also, the identity of Robert Chandler in the back row is tentative and we are not sure of the christian name of the Rayson boy on the left of the middle row. Please help us with any of these if you can, and also tell us if we have any of the spellings incorrect. I have added the names that my mum recalls, I hope they will jog peoples memories. This page was added on 09/05/2008.